NIOSH has released their findings in the Line of Duty deaths of Wilmington (DE) Lt. Jerry Fickes, Capt. Chris Leach and Lt. Ardythe Hope on September 24, 2016. So now what and how does that impact you as a probie, a Firefighter, a Company Officer and especially as a Chief Officer? How does this impact YOUR FIRE DEPARTMENT? Here are some thoughts. 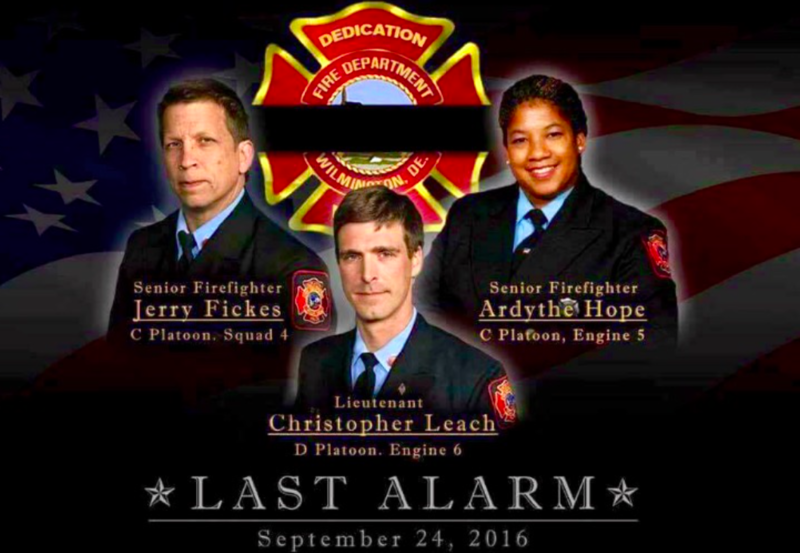 Once again, this is an opportunity for every one of us to compare the circumstances and the findings at that fire to the way our own departments operate daily…as there is no better way to honor their tragic deaths. =Lack on an established continuous and uninterrupted water supply. =Lack of scene size-up and risk assessment. =Lack of a 360 as part of the initial size up. =Lack of command safety role. =Lack of an incident action plan. =Inappropriate fireground tactics for basement (below grade) fires. =Lack of a personnel accountability system. =Lack of rapid intervention crew(s) . =Lack of continuous professional development for Fire Officers and Firefighters. -The first due battalion chief brought the accountability board to the scene and hung it on a fence in front of the house to keep track of personnel. But no one was assigned to manage and update it. -Throughout the incident, Command was not completely aware of what resources from what agencies were in the structure conducting firefighting operations. (With more and more auto-mutual aid, and mutual aid, companies must display the strictest of discipline so they the “right hand knows what the left hand is doing”-and that those in command/accountability are fully aware. This CAN be done with minimal radio traffic when polices and discipline are in place). -Command was not aware of fireground operations on (the rear of the house). =The department had no standard operating procedure for tackling basement fires. -The incident commander lacked a Mayday checklist. =Due to issues with radio communications and the urgency to locate the missing fire fighters, the incident commander was quickly overwhelmed. =The fire department lacked annual proficiency training and evaluation. Honestly, we are pleading with you to take this information and genuinely evaluate yours and each of our departments.